For mermaid styles. Texturize, body and tousle. It's got to be got2b! Want to feel like you've just stepped off the sand and have that wind-blown, tousled beach look? 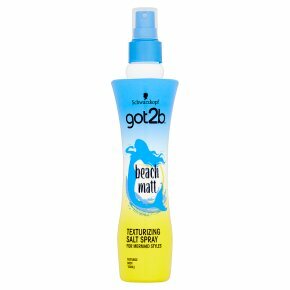 got2b beach matt texturizing salt spray gives your hair beachy waves - mermaid style! The salt infused formula provides you with full of texture and a tousled finish anytime you want and all without the crunch! Now you can rock mermaid waves all year long, even when the beach is nowhere to be seen! How to create beach waves: Spray evenly on dry or towel-dried hair. Scrunch or tousle-style as desired. Blow dry or let the wind do the rest. Do not spray into eyes.